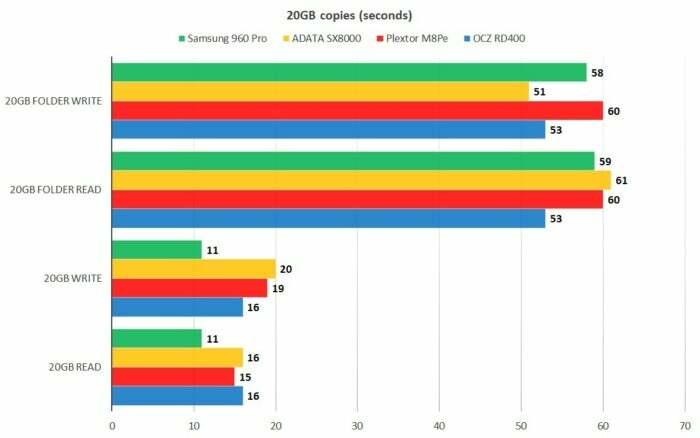 We hope other NVMe SSDs will soon follow ADATA's lead on pricing. 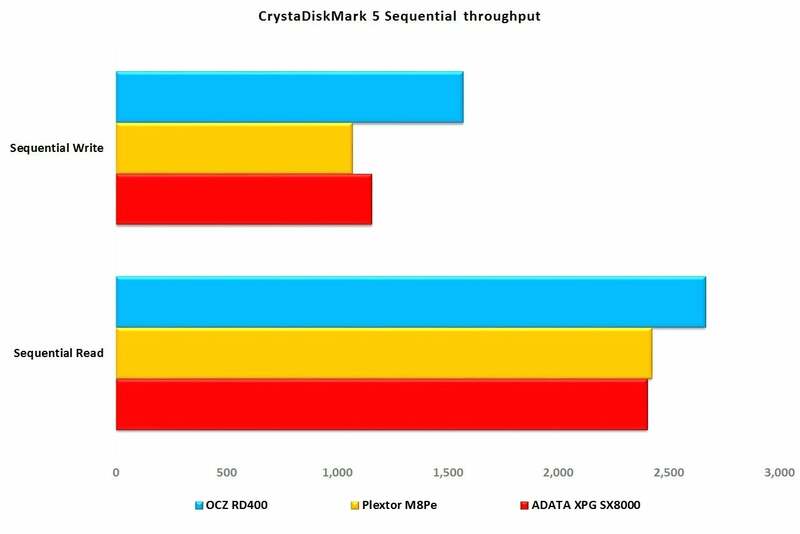 M.2 NVMe SSDs such as ADATA’s XPG SX8000 are a game-changer for PCs. There is simply no other upgrade that offers as dramatic an improvement to the feel and response of your system. If you’re moving from a hard drive, you’ll be astounded. If you’re moving from a SATA SSD, you’ll still be extremely pleased. 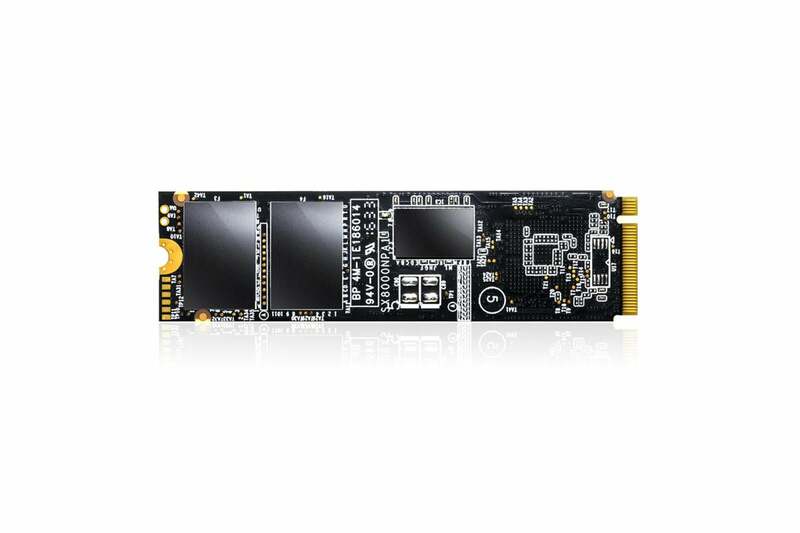 The SX8000 is a four-lane, PCIe 3.0 (1GBps) M.2 2280 (22mm wide, 80mm long) SSD using 3D (layered) TLC NAND technology. To mitigate the relatively slower writes of TLC (triple level cell/three-bit) NAND, a DRAM cache is employed, as well as some of the TLC treated as SLC for a secondary cache. Stacked/layered/3D NAND is used for storage in the SX8000, but there’s cache to keep performance brisk. Note: The digital removal of chip markings was done by ADATA, not PCWorld. ADATA quoted us prices of $76 for the 128GB version, $110 for the 256GB version, and $208 for the 512GB version. The prices we saw on Amazon were a bit higher (with the 512GB listed at $250, for example), but still significantly lower than anything other than the Samsung 960 EVO, a drive we haven’t tested yet. A 1TB version of the SX8000 was mentioned in the PR materials, but hasn’t materialized yet. The XPG SX8000 performs more on par with OCZ’s RD400 and Plextor’s M8Pe than with Samsung’s killer 960 Pro. But even the slowest NVMe SSD is roughly two to three times the speed of a SATA SSD, so that’s no big knock. Installed in a system, it’s difficult to tell NVMe SSDs apart—they’re so fast, only the benchmarks reveal the difference. While it can’t match the Samsung 960 Pro in sustained throughput, the SX8000 turned in very competitive numbers with sets of small files and folders. Shorter bars are better. Though not as fast as the OCZ RD400, the ADATA SX8000 is still very fast, and significantly less expensive. Larger bars are better. The charts above reiterate the fact that the SX8000 isn’t one of the faster NVMe SSDs we’ve tested. But the fact is, it’s still very speedy and provides the same startling subjective increase in performance the others do. With an NVMe SSD on board, disk I/O basically ceases to be an issue. Note that we also ran AS SSD, which showed the SX8000 performing about the the same as in CrystalDiskMark. This generally means that the drive is ignoring the FUA (Forced Unit Access) command that AS SSD issues, which disables all caching. As it’s a matter of a few tens of milliseconds before caches are emptied, there’s little chance of data loss. The FUA issue is the reason we don’t quote AS SSD scores for NVMe drives, which unlike SATA SSDs, often obey the command. Not everyone can use an NVMe SSD. First off, you must have an M.2 slot with four PCIe lanes. If you have PCIe slots, you can use a PCIe M.2 adapter card. Secondly, to get the most out of the drive, you want to run your operating system on it, so you must have a system that recognizes the drive and can boot from it. That said, while the XPG SX800 isn’t the fastest NVMe drive we’ve tested, it is affordable and absolutely fast enough to give you that NVMe thrill. And it’s warrantied for five years, and/or 80TBW (terabytes written) per 128GB of capacity, which is comforting. Most users never come close to writing that much data. The ADATA XPG SX8000 gets an extra half star for its affordability alone. It's not the fastest NVMe SSD we've tested, but it's particularly adept at writing batches of small files, and it's still two to three times faster than the fastest SATA SSD. Good stuff.